Red Dome Mine has top quality lava rocks that can be used as landscaping rocks in Utah. When it comes to getting your landscaping rocks in Utah, go straight to the source. The source for all of your landscaping rock needs is located in Fillmore, Utah at the Red Dome Lava Mine. We have over 100 Million tons of lava rock. With landscaping rocks, there are many options based on the size and color you need. This can go from ground cover, soil preparation, to large boulders. We provide all the different landscaping rocks in Utah and can ship to other states as well. Do you get tired of dirt and mulch that can blow away in the wind and fades over time? Our lava rock will stay in place, even in a heavy storm and won’t fade over time. This is a great option that will save you time and money. Basalt, created through the cooling and solidfication of magma and lava, can create greater balance in the soil providing nutrients for optimal plant health and vitality. The website, “doityourself.com” has an article all about DIY Lava Rock Landscaping (https://www.doityourself.com/stry/diy-lava-rock-landscaping). In this article it goes through the steps in the best ways of using lava rock. 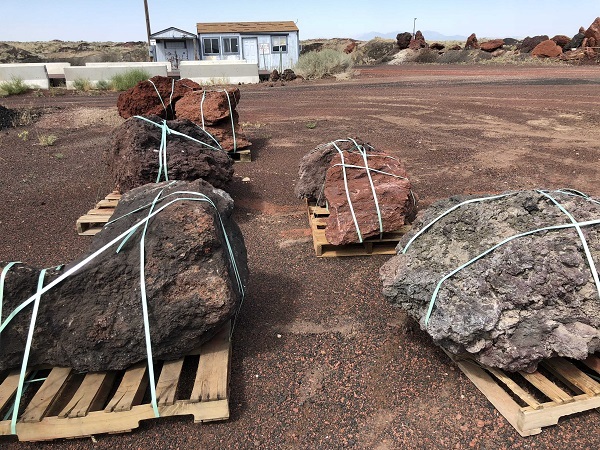 Although there are many different rocks you can use, lava is quickly becoming the rock of choice for landscaping rocks in Utah and other states. 1. Deciding On Your Design – Your design is only limited by your creativity. You can look online at images of yards that others have done to get ideas in your design. 2. Preparing Your Garden – You need to remove all the weeds and grass. Lava rocks can help deter weed growth. Keep in mind your design as you mark areas for larger rocks and plants. 3. Inserting Your Lava Rocks – Now you’re ready for your landscaping rocks. You may want to dig a little hole for the larger rocks to sit in. Because lava rocks are light weight, you’ll be surprised at how large of rocks you can move on your own. 4. Creating Your Borders – Now that your larger rocks are in place, you can insert your smaller lava rock ground cover and plants.